For the book, see Touching the Sky (book). Find and retrieve Auriel's Bow. After learning the location of Auriel's Bow, travel to Darkfall Cave. The cave is very dark, so you may wish to light your way using torches, the Vampire's Sight ability, or light spells. Follow the path, past a frostbite spider until you come to a bridge and what seems like a dead end. There are a few moonstone rocks, and a pickaxe here as well. Once you try to cross back over the bridge, you will be forced, by either a rock trap or the bridge collapsing, into a very fast moving underground river that sends you downstream. Try to keep your head above the water, unless you have a waterbreathing ability. Eventually, you'll be thrown out of the current, and attacked by a few frostbite spiders. Continue along the path, until you reach a small camp. If you have Serana, she'll make a remark about how horrible the sight is. At this point, you have a few options. There are two visible paths. The first one, right behind the dead Breton, will lead you on a winding path, straight to a room with two trolls. The other path will take you through an area with spiderwebs blocking your way; destroy them to reveal a giant frostbite spider that may be fighting with a vampire. Eventually, you will find a large open area containing two trolls. Alternatively, you may skip the trolls' room by pulling the chain hidden behind the dead Breton's lean-to and taking the passage it reveals. At the other end of the large cave you will meet Knight-Paladin Gelebor, one of the last two Snow Elves. He tells you that in exchange for his help obtaining Auriel's Bow, you have to slay his brother, Vyrthur, who was corrupted by Falmer, whom he calls "The Betrayed". Vyrthur is hiding in the Inner Sanctum of the Forgotten Vale, a gigantic outdoor elven ruin with Ayleid-like architecture. In order to make your way there you must fill a jug, the Initiate's Ewer, with water from five wayshrines: the Wayshrines of Illumination, Learning, Radiance, Resolution, and Sight. 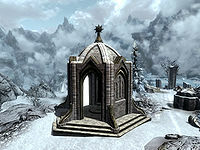 The first wayshrine, the Wayshrine of Illumination, is through the portal Gelebor opens that leads you to Darkfall Passage and is tended to by Prelate Sidanyis. You will find it at the end of a long, dark trek through Darkfall Passage, where you will encounter several leveled Falmer and chaurus. Be sure to destroy any chaurus cocoons you come across before they have a chance to hatch. To get to the wayshrine, just follow the winding path, illuminated by tube worms (which look like odd pink flowers) that disappear as you walk past. The second wayshrine, the Wayshrine of Sight, can be found soon after emerging from Darkfall Passage into the Forgotten Vale and is tended to by Prelate Athring. It is to the north of the path that climbs up out of the entry vale through the arches, and west/northwest of the Forgotten Vale Cave. The third, the Wayshrine of Learning, tended to by Prelate Celegriath, will be found after continuing up the path, passing through a narrow pass inhabited by frostbite spiders, then dropping down to a narrow river valley. The wayshrine is located just downstream from where the path reaches the river bank. After crossing the river below the third wayshrine, zig zag southwest and northwest up the steep path to a large, frozen lake. Beware the two dragons, Naaslaarum and Voslaarum, that will attack you as you cross the frozen lake (if you have killed the dragon in Dragon Rising). The fourth wayshrine, the Wayshrine of Resolution, is above the northwest bank of the lake and tended to by Prelate Nirilor. Don't forget to pick up a Shout from the large rock jutting out from the middle of the lake on the eastern side of the lake. The fifth and final wayshrine, the Wayshrine of Radiance, can only be reached after a long, arduous trek through Forgotten Vale and Glacial Crevice. Before entering the Glacial Crevice, take a right down the last bone bridge. Keep going and you will come to a small Falmer hut which houses Unknown Book, Vol. III, "FAIRE AGARWEN LIFE RECORD" (See Forgotten Vale Books Quest). Go back and enter the entrance to Glacial Crevice. The initial path through Forgotten Vale takes you through a series of Falmer dwellings nestled in among the cliffs above the river, and connected by a series of rope bridges and stone ramps. Fight your way through the leveled Falmer that call this area home, then enter Glacial Crevice. This area consists of a series of glacial chambers with icy ledges and rope bridges that ascend among a scattering of Falmer tents. Dispose of the many leveled Falmer that occupy this zone until you once again emerge out to Forgotten Vale. This final part of the Vale consists of a confusing maze of Falmer tents and platforms crowded within a series of narrow, twisting canyons. Pick up the Unknown Book Vol. IV from a hut in the second village, before the wayshrine. The ascent to the Wayshrine of Radiance, tended to by Prelate Edhelbor, is a tunnel containing several Quicksilver Ore veins found on the canyon floor at the very end of the Falmer village. Down the path from the Wayshrine of Radiance is the Inner Sanctum. Upon entering, you will find many frozen Falmer and chaurus in the entry chamber. Many of the Falmer hold items that can be looted, which may cause one or more of them to break out of their icy state and attack. Place the Initiate's Ewer on the pedestals to open gates as you make your way to Vyrthur's chamber. 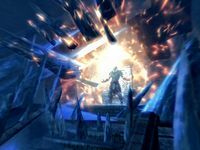 During battle, he causes the ceiling to periodically collapse as he awakens several waves of Falmer and chaurus to attack. When all frozen enemies are gone, he will collapse the rest of the roof on you and a cut scene will commence. You will wake up with Serana telling you to get up and get on the balcony. 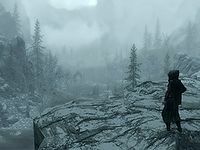 You will be able to move during this scene but cannot take any other action during the dialogue sequence until Serana's confrontation with Vyrthur is completed. After she releases him, you will be free to act and it is up to you to finish him off. The temple balcony is above the frozen lake near the Shrine of Resolution, so if you blast him off the balcony but want to loot his body for some ancient Falmer armor, then look down on the lake below. When Vyrthur is dead, a wayshrine will appear and Gelebor will come through. He will be surprised at the real reason for Vyrthur's actions, and thank you, telling you that you deserve to carry Auriel's Bow. He will also bless some Sunhallowed arrows for you if you ask, and remain there if you wish to come back for more at any time. You may use Auriel's Bow to blot out the sun. It will not be permanent but will only last until 7pm (which is sunset; you can shoot out the sun again the next day, as the sun will rise at 5am). After a wayshrine is opened, it will contain portals to three of the other four opened wayshrines, as well as to Darkfall Cave. At the end of this quest there is an opportunity to gain a second permanent follower. Right after you kill the boss, Serana will stop following you around and you can fast travel away to grab a second follower. There isn't a direct return point, but you can fast travel back to Forgotten Vale and use the portals, then run quickly back through the castle and finish the quest by speaking with the NPC waiting for you and taking Auriel's Bow. This time, your second follower slot should be permanent - though you should make sure to have two followers for 'Kindred Judgement' and any plot quests that are instanced. You can swap your other follower, but never dismiss Serana or you will lose the second slot. If you have not killed Naaslaarum and Voslaarum it is possible for one of them to fly to the balcony and interfere in the fight with Vyrthur. They can even kill him for you. South of the Temple balcony is a hanging valley with a waterfall pouring from it down to the frozen lake. This valley is the location that the Emerald Paragon gives access to, and can be reached from the balcony by using the Become Ethereal shout and careful cliff walking. Note: Nearly all of the bugs mentioned below occur because Gelebor, Serana, or Vyrthur have uncompleted scripts running. Be sure to allow any dialogue they are speaking to complete before taking further action. Also, make sure that the scripted actions with the Initiate's Ewer and the Wayshrines have completed before going on to the next wayshrine. When you have finished collecting the ewer, and are about to pour it in the basin, it won't react and you will be stuck. If you have this problem, open the console and enter GetStage DLC1VQ07 . If it returns 132.00, that means that somehow the quest progressed past the next stage of the quest. Since you cannot go back stages, the only way to solve this problem would be to use SetStage for every stage past "Gain Entry to the Inner Sanctum" until the current stage number is above 132 (meaning SetStage DLC1VQ07 200 , completing the quest, giving you the bow, and starting the next quest). This will mean skipping quite a lot of stages, but there's no way to fix this bug at the moment without skipping. Alternatively you can use console command coc DLC1FalmerTemple01 and SetStage 110 (assuming you are just stuck at the basin). If coc is useless, and your queststage is 110, use the sapphire paragon. You must use console command tcl, and then you can gain entry to the Inner Sanctum (remember to use tcl again after gaining entry). Then, leave from the Inner Sanctum via the door, and Serana will be with you again. When given the objective to fill the Initiates Ewer, one of the wayshrines may not give you any water making the quest impossible to complete. Reloading and visiting the wayshrines in a different order may fix this. If you can't get water because Skyrim thinks you are in combat, exit the cell then re-enter it. You may be unable to kill Arch-Curate Vyrthur. ? If that happens use the console command killall. You might have to give Serana the resurrect command in the console afterwards. When you activate the first wayshrine, the portal may not appear. ? The portal may be invisible. Pressing the 'activate' button while standing in the back of the wayshrine may activate the invisible portal. After confronting Arch-Curate Vyrthur and defeating the first wave of unfrozen enemies, he may not react and spawn a second wave, ceasing quest progress. ? Each subsequent wave will only occur after all mobilized enemies have been killed. These enemies are not the frozen ones standing about but are spawned as the waves progress, sometimes replacing the frozen variety. Sometimes they spawn inside the architecture or get stuck in odd places. If area effect spells cannot kill them reloading a save is your only recourse. After each wave there is a pause before Vyrthur gives another rant and unleashes the next wave. Sending an arrow or two, or an area damage spell in his direction may speed things along a little. This can also be fixed by using the command "killall" in the boss arena (note that both Vyrthur and Serana will be put on the bleed out state as both of them are set to essential at the moment and cant die) but this updates Vyrthur's Scripts and can hopefully allow you to progress, if that's the case and Vyrthur Summons the Ancient Frost Atronach, immediately hit the console, click Serana and use the command "resurrect", once you kill the Atronach Vyrthur will do a shockwave and run to the balcony, once he reaches the balcony he will die (because he is not set to essential anymore) just click on his corpse and "resurrect" him, and that'll hopefully allow the following scene and boss fight to progress normally. Knight-Paladin Gelebor may not activate the first wayshrine. ? Open the console and select Gelebor, enter the code disable, then enable. The final objective to 'Retrieve Auriel's Bow' may not properly register as completed as it should, even after picking it up. A message signifying the quest's completion will still turn up, though the game ceases to progress after that. Neither Serana nor Gelebor will have proper dialogue options, and the following quest, 'Kindred Judgement', does not begin. Use the console command setstage DLC1VQ07 200 to properly complete the final 'Retrieve Auriel's Bow' objective. 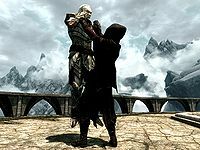 Serana may attack Gelebor immediately after you finish the first dialogue with him, ceasing quest progression. ? Using the console command killall will fix this. You will have to wait a bit, until dialogue starts between Serana and Gelebor. They will both remain in the crouched, dying position, but they will go back to normal once a new area is entered. After finishing the quest, Serana might not have the dialogue to start Kindred Judgment but will allow you to use her blood to make Bloodcursed arrows. Completing a minor side quest before fighting Vyrthur may fix this. 10 The vision provided by the Elder Scrolls seems to indicate that Auriel's Bow may be located in a place known as Darkfall Cave. I should proceed there as soon as I'm prepared if I wish to recover the bow and stop Harkon from completing the Tyranny of the Sun. The vision provided by the Elder Scrolls seems to indicate that Auriel's Bow may be located in a place known as Darkfall Cave. I should proceed there as soon as I'm prepared if I wish to recover the bow and stop Harkon from completing the Tyranny of the Sun. 50 I've encountered Gelebor, a snow elf Knight-Paladin of the Chantry of Auri-El. He's requesting I kill his brother, Arch-Curate Vyrthur, who's been corrupted by the Falmer. I've been given an Initiate's Ewer which will ultimately provide me access to the Chantry's Inner Sanctum where both Arch-Curate Vyrthur and Auriel's Bow are located. 100 I've completely filled the Initiate's Ewer given to me by Knight-Paladin Gelebor. All that remains is gaining access to the Chantry's Inner Sanctum where both Arch-Curate Vyrthur and Auriel's Bow are located. 110 I've gained access to the Chantry's Inner Sanctum. I should find and confront Arch-Curate Vyrthur in order to secure Auriel's Bow. 200 Finishes quest It's been revealed to me that the Tyranny of the Sun was created by Arch-Curate Vyrthur as his revenge upon Auriel for rebuking him when he was turned into a vampire. He possessed Auriel's Bow, but still needed the blood of a pure vampire to complete his ritual. This placed Serana in mortal danger, and I had no choice but to destroy him. I now possess the final piece of the Tyranny of the Sun, Auriel's Bow. The following empty quest stages were omitted from the table: 0, 35, 36, 60, 65, 70, 80, 81, 82, 85, 86, 87, 90, 91, 92, 95, 96, 97, 105, 130, 131, 132. On the PC, it is possible to use the console to advance through the quest by entering setstage DLC1VQ07 stage, where stage is the number of the stage you wish to complete. It is not possible to un-complete (i.e. go back) quest stages, but it is possible to clear all stages of the quest using resetquest DLC1VQ07. This page was last modified on 26 January 2019, at 06:45.